Learn English Online - Built by Experts. For You! Improve your English. Excel in today's competitive environment! Learn from experienced English Experts. Ask unlimited questions. Follow a Study Plan tailored to your needs. Benefit from individual attention. Build your vocab, ace English grammar and Reading Comprehension! Instant analytics to help you identify exactly what you need to work on. By 2020, the British Council forecasts that TWO Billion people will be Speaking or Learning English. English Fundas is everything you need. From the start till the finish line. We’ll prepare a personalized study plan for you based on how you perform on a 30-minute Benchmarking Test. The plan’s daily tasks will help you master the fundamentals of English, and help you gain confidence in your test-prep! After each of your Milestone Tests, you will receive a personalized feedback report on your performance. This will highlight the areas in which you have shown definite progress, point out your weaknesses and direct you to topics on which you need to focus. The 3 comprehensive Milestone Tests are carefully designed to test you on your progress in all the areas of English fundamentals. By the end of your course with Galvanize, you will find your English and your reading skills significantly improved. Get expert guidance throughout your course period. Whenever you need help or have any questions, post your questions online and our experts will get back to you! 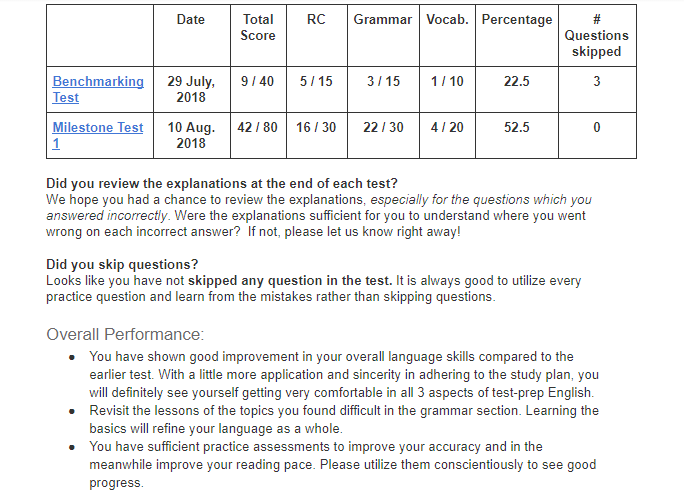 I want to give the GRE after the completion of my second year but first I want to improve my English language skills. GRE Verbal seemed very difficult. That's when I decided to enroll for the English Fundas course. So far, the Vocab App has been extremely helpful for me. The illustrations are very useful. The words on the Vocab App have gone a long way in helping me. Everyday I choose 5-6 words as instructed and then I practice sentence formation. I aim to make ten sentences a day. Daily practicing of these words and the wholly supportive nature of your Galvanize team really helped me a lot in my journey.